WIYDB? Dispatches from the Front Lines of Motherhood: Baby Food - What and When? Parenting advice is very subjective. What works for one baby might not work for another for a large number of reasons; temperament, season, heck even the year on the calendar seems to have an impact. Mothers that raised my generation tell me constantly that babies were put to bed on their stomachs to avoid aspiration of any spit up - a recommendation that has now been changed to a back sleeping philosophy to avoid suffocation. Another trend that seems to have changed is feeding milestones. When should you start solids? What should you start with? With a 4 month old son and a mixed bag of answers, I went on a full fledged investigation. My first stop is always my Mom. She not only raised me, my two sisters, and guided an additional host of cousins, but she did home daycare for over a decade. Her recommendation is not only logical, but what I assumed was correct before asking. When: Approximately 3 to 4 months. Generally speaking the liquid only diet is not cutting it anymore at this point and the solids lengthen time between feedings and aid in sleeping a full night. An exciting prospect. What: Rice cereal. It can be slowly added to a bottle to thicken what the baby is already drinking and accustom them to the texture. Afterwards you can introduce other cereals (alone, then mixed) followed by pureed produce and on down the line. The only problem, I felt, is that my baby didn't seem ready. No offense meant to Mom, of course, but he didn't seem to be eating overly often, or much, and sleeping 6 hours at a stretch meant I wasn't too hard done by in the sleep department either. With boxed cereal stating 6+ month disclaimers, I decided to continue by asking my family doctor and her advice surprised me a little. Not just a GP, but a young mother of 2, she knows her stuff. I took it seriously, but I admit I scratched my head for a little while afterward. When: 4-6 months, when baby can sit up on their own and seems more interested in what you are eating than their meal (reaching, crying, not seeming satiated, etc). What: Anything! She told me current practices state that you don't need to start with a cereal, or even a vegetable. You could go straight to meat, so long as you don't start with dairy! On that front, she said homogenized milk can be introduced at 9 months now, 3 months earlier than previously recommended. While I am certainly not a medical professional and am still new in this whole motherhood game, the thought of my little one's first meal being pulverized chicken seems more than a little bizarre. Plus milk under a year? That goes against everything I thought I knew about baby dos and don'ts. I decided to take it to the streets and ask my fellow moms through a web poll and two separate mommy groups. With the advice of these additional thirty or so women, this is what I have learned. When: 3-6 months, when the baby is feeding too frequently or is never satisfied. So, what did I establish for my own hungry little bundle of joy? I guess, as with anything, it just depends on the baby. Talk to your trusted resources and go with your gut. You'll know when what you have been doing doesn't seem to work anymore. 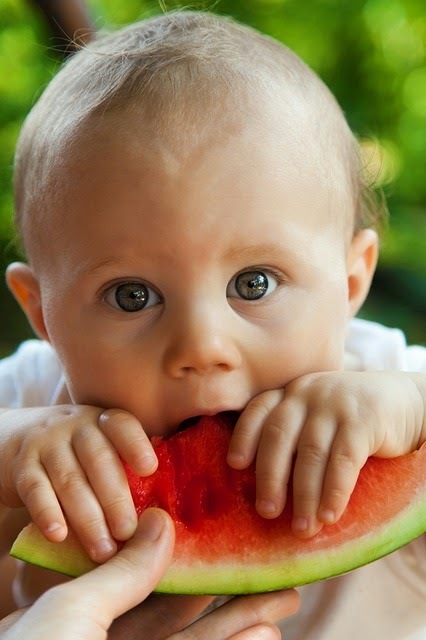 Look for some tell tale signs such as; baby constantly eating or upset, not gaining enough or even losing weight, and frustration by or grabbing at table food. Whether that means weaning from breast milk, switching to soy, or getting out your baby spoons, discuss your options when you think it's time. Mother knows best.